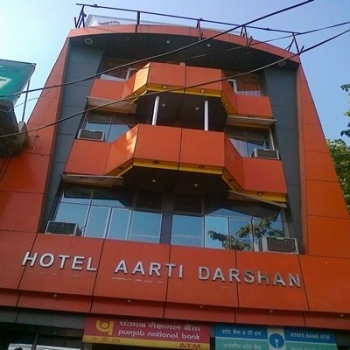 Hotel Aarti Darshan is a deluxe hotel located in the holy city Haridwar. It is situated close to famous pilgrim places like Har Ki Pauri and Mansa Devi Temple. Many devotees from far away places come to visit the temple to bow their heads in front of the almighty. The hotel has well furnished rooms with modern decor. To make the stay nostalgic, the hotel offers sightseeing facility and also assists in exploring other tourist spots. One can experience euphoria while they take part in the evening Ganga Aarti held at Ganga Ghat which is close to the hotel. The hotel is located at Har Ki Pauri which is at the foot of Holy River Ganga. Har Ki Pauri is the first place where divine Ganga touches plains, leaving behind the pristine ranges of the Himalayas. The ghat is also known as Brahma Kund which is famous for a stone with imprints of Lord Vishnus feet, as indicated by the name. The Ganga Aarti is the most enchanting moment which is held on the banks of river Ganga by the priests. The river banks looks mesmerising with the glittering leaf lamps bedecked with flowers floating on the river. The aura of lights create a splendid charm which is further accentuated with the Holy chants that makes the ambience divine. The hotel offers 11 well-appointed rooms enriched with elegant interiors and vibrant colors. The spacious rooms consist of cable Tv, make-up mirror, wardrobe, bottled/drinking water, dining table, sofa-bed and an attached bathroom. The modern rooms of the deluxe hotel are air-conditioned to provide relaxation and comfort to its guests. Theres a balcony providing a clear view of the holy place. Lip-smacking and appetising food is served in the private rooms of the guests. In the comfortabloe rooms guests can have delicious food while watching their favourite show or having a great time with family. The room service is excellent and the hotel management takes good care of its guests. By Road - Haridwar is connected well by tourist as well as state owned busses. All cities in and around Haridwar are connected with state owned busses. To provide ease and comfort to the tourists deluxe busses are also available from Delhi to Haridwar at regular intervals. Bus services are also available from major cities like Jaipur, Jodhpur, Dehradun, Shimla and many other cities located close to it. By Train - Being a famous pilgrim place Haridwar is connected well with railways leading to beautiful destinations. Haridwar Railway Junction Station (IR station code : HW) is well connected to major cities in India. There are also few trains that run frequently to Rishikesh at regular intervals. The railway station is located on the southward direction of the town. Har Ki Pauri is at 2 km distance from the station. By Air - One can reach Haridwar easily because of the availability of airports close to the city. Jolly Grant Airport at Dehradun is the nearest domestic airport from Haridwar which is 20 km away. The airport operates daily flights to Delhi. Indira Gandhi International Airport is the nearest international airport which is 200 km away. It is well connected to most of the domestic and foreign airports.